Happy Easter everyone! Whether you celebrate it or not, I hope your day is filled with happiness! I have no idea how American Easters go, since I grew up in Poland and our traditions are different when it comes to holidays like that. But whatever it is you do, I hope you enjoy it! 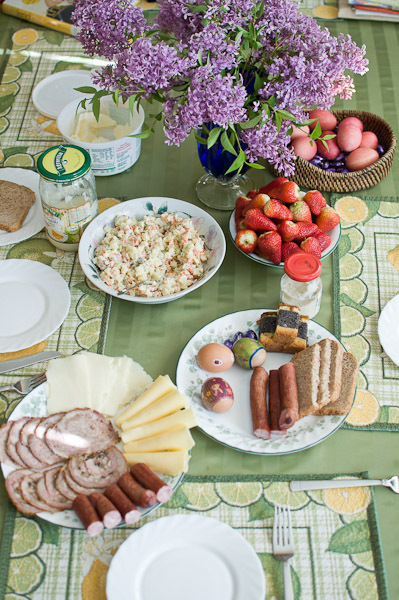 This is how our Easter breakfast looked like: I didn’t touch the meat though, not exactly my thing. Especially since I started reading The Kind Diet last night, meat isn’t looking super favorable right now. I was debating on either making a carrot cake or cupcakes yesterday. You can see which choice I ended up making. Typical. I just like cupcakes too much. 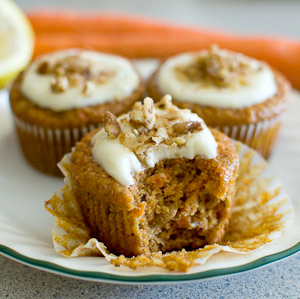 Thankfully, these are a healthier alternative to your regular carrot cupcakes. 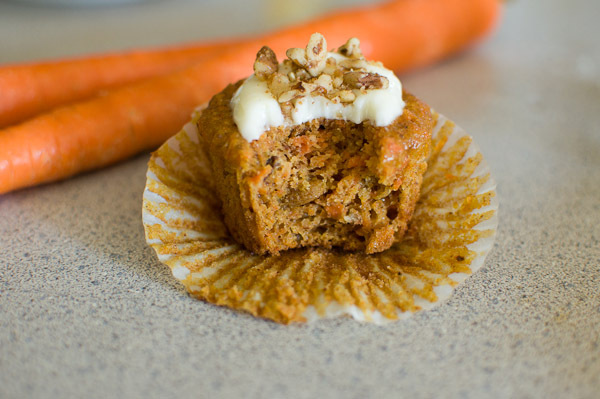 Plus, today was actually the first time I actually enjoyed eating a carrot (cup)cake. I wasn’t a fan of carrot cake before. But then again, I guess taste preferences change over time. Apparently, our taste preferences change every 7 years or so. This fun fact has proven true in my own experience – I used to hate spinach and mushrooms as a kid, but now I love them. I used to hate fish, not I love sushi and fish! Those are just the examples I usually go for, but there have been many more similar taste changes I’ve experienced. Anyway, I hope your day is filled with joy! It seems like a beautiful day out in Chicago. Definitely going to be taking advantage of that today with my parents. I am so thankful for having a food processor. 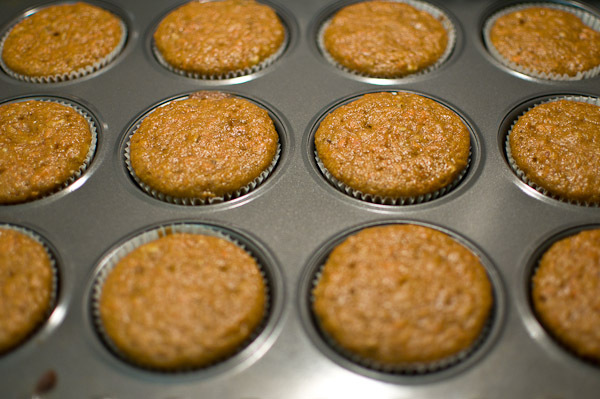 Don’t be afraid to fill the liners almost all the way up – the cupcakes won’t grow very much. Once they do, they fall back down quite a bit after being out for a while. In a large bowl, whisk the oil, brown sugar, and eggs until well combined. 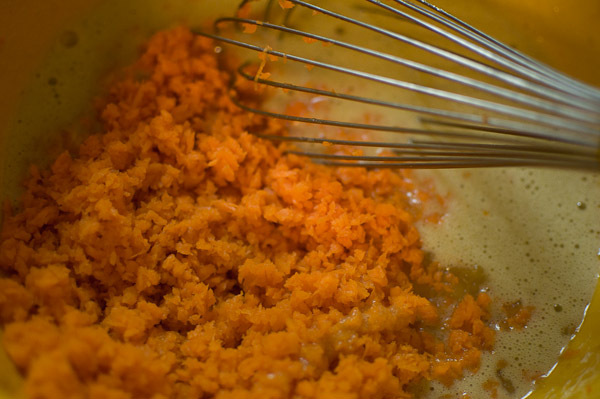 Whisk in the applesauce, vanilla, and carrots. Stir in 1/4 cup of pecans and 1/3 cup raisins and mix again. Divide the batter between the muffin cups. Bake until a toothpick comes out clean, about 20-25 minutes. Transfer to wire rack to cool completely. With an electric mixer, beat together the cream cheese, confectioners sugar and lemon zest until smooth and creamy. Frost the cooled cupcakes and sprinkle with the remaining 2 Tbsp chopped nuts. The cupcakes should be stored in the fridge for up to 3 days. So yummy and moist. Mmmmm! Not stopping at one, that’s for darn sure! 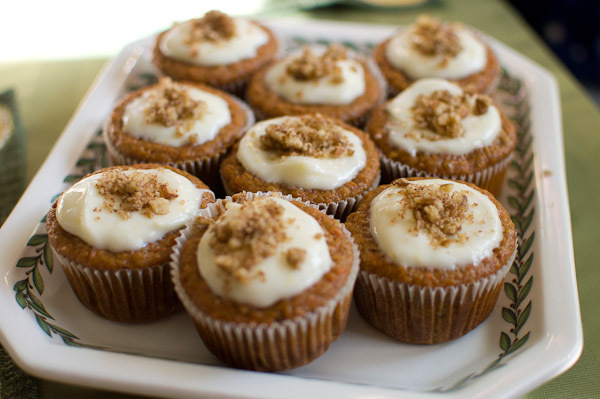 What’s your favorite kind of frosting to use on carrot cake or cupcakes? What about add-ins? These look INCREDIBLE! Wow. Springtime just screams carrot cake … and I’ll always choose lemon flavored desserts when I can 🙂 Enjoy your Easter Sunday! Those look absolutely delicious! Yum!! I hated mushrooms as a kid too, now I love them. It’s weird, isn’t it? These wee cupcakes turned out soo pretty and I love that they are healthier and not too loaded with frosting for a change.. perfect for Easter!! I hope you had a good Easter!! Yum! 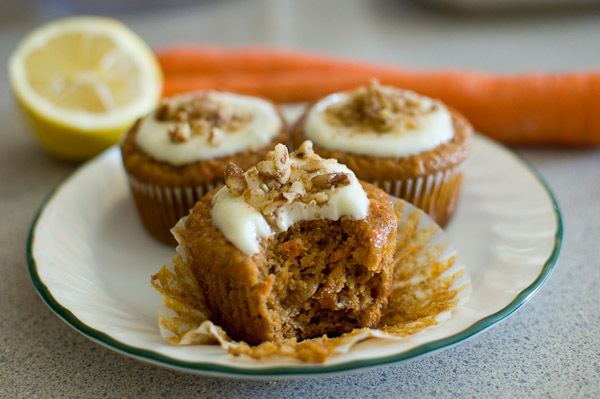 I love carrot cake, one of my faves. It makes cute little cupcakes. These look so good and I like the potion control of a cupcake. Visiting from a Pinteresting Party and just pinned. Mmm these look so good! 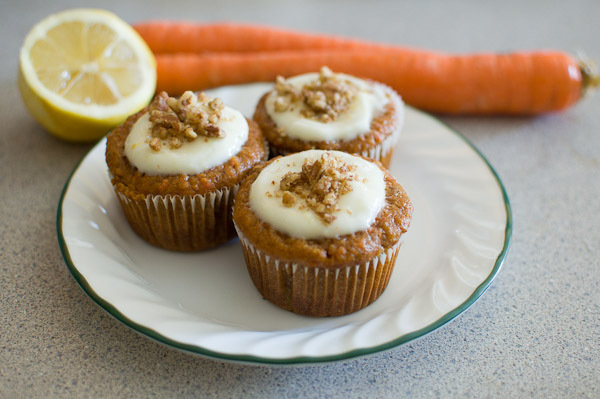 I am tempted to go to a diner and get carrot cake bc I am too lazy to make them,. haha!